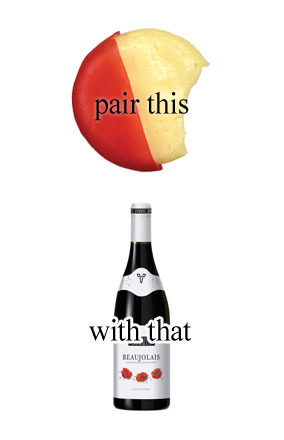 When you pour wine pour deux getting fancy with your accompaniments is important. One must impress with their knowledge of fine wine’s and pairings, you know. But when it’s just you at the table, eschew fancy pantsness for convenience. Individually wrapped Babybel cheeses (I like the ones in the red wax) have a nice bite that compliments the meaty Beaujolais. Of course, if you’re lazy (like me) there’s nothing saying you can’t empty a bag of Babybel’s onto a tray and call it a night. Tasteful tidbit: These baby cheeses make a tasty snack, but before you get comatose from the diary/anti-oxidant combination, toss the waxy packaging. it’s really f*cking hard to get off the floor.